It’s one thing to encourage more women to start their own entrepreneurial ventures, but what are the elements that can ensure their future growth and success? And what countries are doing a good (and not so good) job of providing a “womenabling” environment for growth-oriented women entrepreneurs? 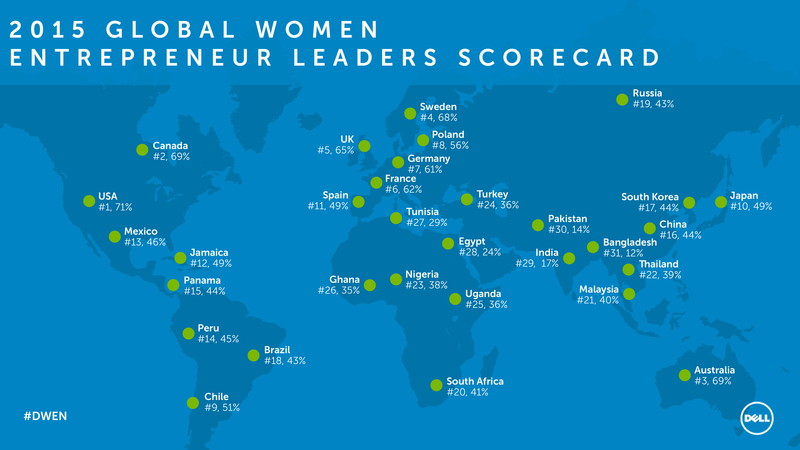 These are the questions asked – and answered – in the new Global Women Entrepreneur Leaders Scorecard, a data-powered diagnostic tool developed by ACG Inc. with support from Dell. One important conclusion of the analysis is that even among highly-ranked countries there is much room for improvement, as the scores – calculated on a 0-100 scale – only reach 71 even in the top-ranked U.S. Build entrepreneurship skills for girls by investing in STEM education. Learn more and download the GWEL Scorecard executive report and methodology at THIS WEB PAGE. This entry was posted in entrepreneurship research, high growth entrepreneurship, international gender rankings, women's business development, women's business ownership, women's enterprise development, women's business research studies and tagged ACG Inc., Dell, Global Women Entrepreneur Leaders Scorecard, GWEL Scorecard, women's business development, women's entrepreneurship by womenable. Bookmark the permalink.